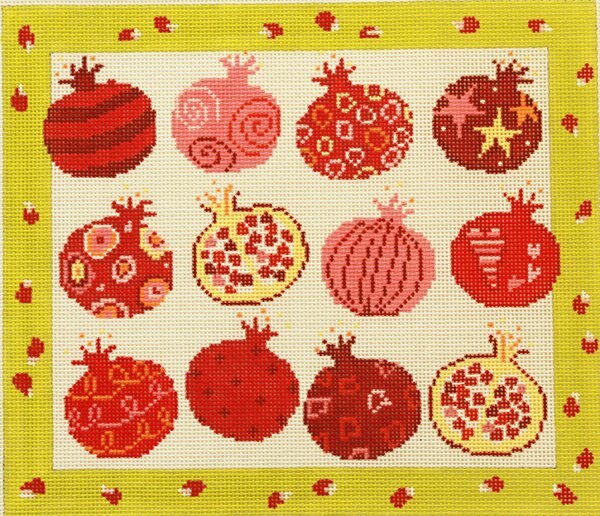 This fresh pomegranates hand-painted needlepoint design is by Pippin Studio. Brightly colored shades of reds and oranges on a white background in a patchwork effect. The design area measures 11" x 10" and is hand painted onto 13 mesh needlepoint canvas. This design can be inset into a pillow or framed. If you require stretcher bars we recommend a set of 15" and a set of 14" and some thumb tacks. This design usually ships within 1 week. If you're in a hurry, or want to know in advance when it can be sent, then please contact us. We are always glad to help.